Figure 1: An array of MAX-DOAS instruments. In order to ensure that products delivered by air quality satellite sensors meet user requirements in terms of accuracy, precision and fitness for purpose, it is essential to develop a robust validation strategy relying on well-established and traceable reference measurements. In this context, the ESA FRM4DOAS project coordinated by BIRA-IASB aims at developing a centralized processing service delivering harmonized MAX-DOAS measurements of key atmospheric pollutants such as nitrogen dioxide (NO2), formaldehyde (HCHO), and ozone(O3) in a near real-time mode. Such a service is essential to support the quality control of present and future atmospheric missions like the Sentinels (4, 5, and 5P) in Europe, GEMS in Asia, and TEMPO in the US. MAX-DOAS (Multiple-AXis Differential Optical Absorption Spectroscopy) is a recognized ground-based remote-sensing technique. It measures the amount of atmospheric trace gases absorbing in the UV-visible wavelength range of the solar spectrum by scanning the sky up and down from the horizon to the zenith and collecting the corresponding scattered sunlight. Since it provides measurements of key tropospheric pollutants at horizontal and vertical scales comparable to the resolution of nadir backscatter satellite sensors, this technique provides an ideal tool for validation. As a results, the number of MAX-DOAS sites has grown substantially over the last two decades, in support to satellite validation activities. 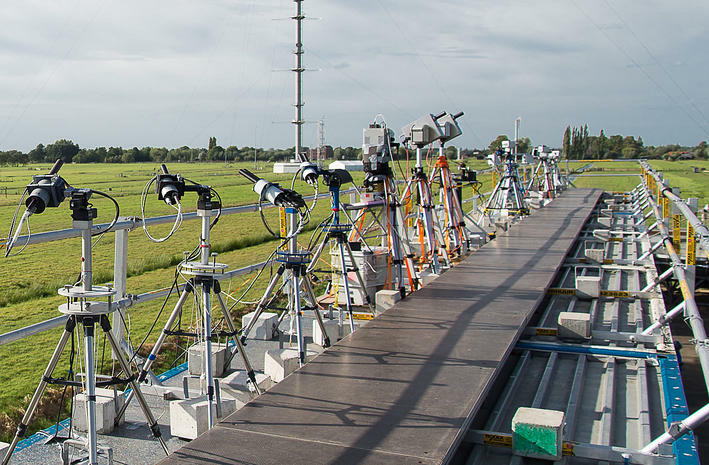 The Fiducial Reference Measurements for ground-based DOAS Air-Quality Observations (FRM4DOAS) project was funded by ESA over the 2016-2018 period to develop and demonstrate a new centralized rapid delivery (24 hour latency) processing service for a selection of MAX-DOAS instruments. Also, in the scope of the project, guidelines and recommendations for instrument calibration and operation were established. FRM4DOAS team was coordinated at BIRA-IASB with as main partners the University of Bremen (Germany), the Royal Netherlands Meteorological Institute (The Netherlands), the University of Heidelberg (Germany), the Max Planck Institute for Chemistry (Germany), and BK Scientific (Germany). 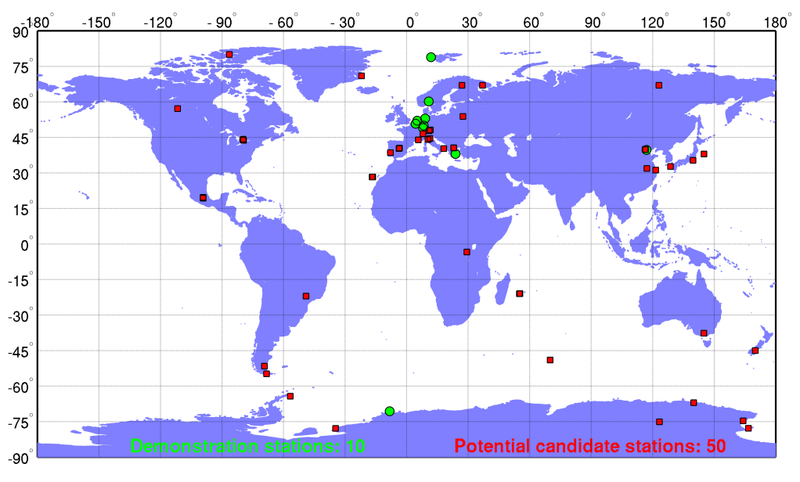 Figure 2: Map of FRM4DOAS demonstration stations (green circles) + potential candidate stations (red circles) identified through a questionnaire circulated among to the whole MAX-DOAS community. In its current state, the FRM4DOAS service is limited to NO2, HCHO, and total O3 data products retrieved at a selection of 10 stations (see Figure 2, green circles). The service relies on the engagement of of instrument scientists who submit their calibrated spectra to a centralized level-1 database. The data processing, which is at the core of the service, is based on state-of-the-art retrieval algorithms selected through a round-robin exercise. The final data products are quality-controlled vertical profiles of atmospheric NO2, tropospheric HCHO, and total O3 columns, all delivered with corresponding error budgets. As a follow-up of the activity (in the 2019-2021 time frame) it is planned to operationalize the system and to integrate it within the NDACC (Network for the Detection of Atmospheric Change) and EVDC (ESA Atmospheric Validation Data Centre) data hosting facilities. This implies a significant upscaling of a large number of stations (red circles in Figure 2). Moreover, additional air quality products will be progressively integrated, such as e.g. sulphur dioxide (SO2), tropospheric O3, glyoxal (CHOCHO), and aerosols.